[#Choice4Life]: What is #VAPPbill? 4 Must-Know Q&A on the Popular Bill! The Violence Against Persons Prohibition (VAPP) Bill 2011is a proposed legislation which defines violence, seeks to eliminate violence in private and public life, prohibits all forms of violence, sexual, psychological, domestic, Harmful traditional practices (HTP), discrimination against persons and provides all round protection and effective remedies for victims as well as punishment of offenders. It was passed by the House of Representatives in March 2013. It passed through 2nd Reading unanimously on October 16, 2014. 2. What does the Bill Seek to Do? It seeks to eliminate or reduce to a minimum the occurrence of gender based violence in the Nigerian society especially in homes, public spaces or even in conflict situations. It therefore protects the Right of Nigerians against violence especially violence against women. It aims at addressing the gaps in current laws on violence in private and public spaces. Specifically, it is aimed at responding to old and emerging forms of violence; in particular gender based violence. 3. What are the Legal and Social implications of the Bill? it criminalizes violence against ALL persons, providing matching penalties for offenses in order to halt the high level of impunity of offenders in private spaces, especially domestic violence in all its ramifications. It also creates a support system for victims of violence to minimize pains and enhance recovery. 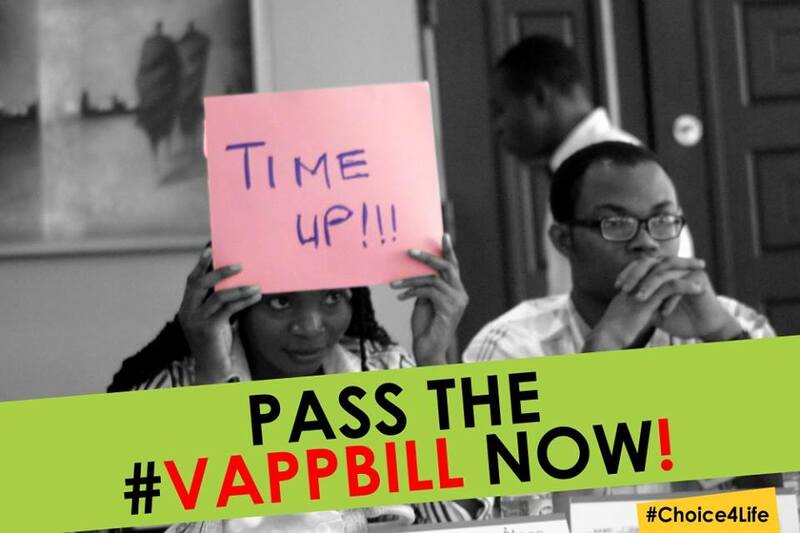 4. Who supports the #VAPPbill? Members of the Senate and House of the Representatives relevant Committees massively supported by other members of the two Chambers, the Ministry of Women Affairs, Developments partners especially the DFID, UNFPA, UNICEF, UN Women, Ipas, and ActionAid, the National Human Rights Commission , the Nigeria Police Force, national and private owned print and electronic media, the entire membership of Legislative Advocacy Coalition on Violence Against Women (LACVAW), #Choice4Life Advocates, @HAPPYNigeria, Women Rights Advancement and Protection Alternative (WRAPA) Raising Her Voice Project Partners and indeed all Civil Society Organizations and individual working on women’s human rights. Commend the National Assembly for their actions so far on this bill and encourage the Senate to expedite action and pass it before the elections. Stand against violence against persons in any form. Lend your voice in support of a quick passage of #VAPPbill!